We formulate Acidetain Tablets using quality approved chemical compounds and therefore, are safe to consume. These tablets are formulated under the supervision of experts. 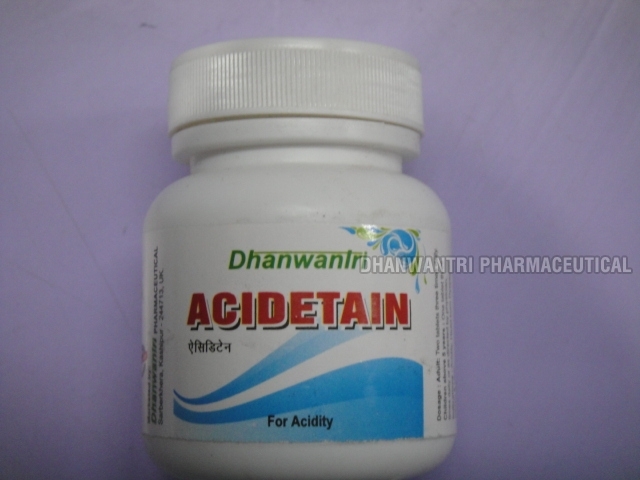 We are counted among the top Manufacturers and Suppliers of Acidetain Tablets. Due to our vast distributed network, it has been an easy for us to reach buyers within the stipulated time frame. One can obtain Acidetain Tablets from us at market leading prices. Indications : Acidity, Heart burn Dyspepsia, GERD & Ulcer. Adult : Two Tablets three times daily. Children Above 5 years : One tablet three times daily or as directed by physician.